At first glance, you will see the Leach Home is the epitome of elegance. With attention to detail, combined with a focus on an active lifestyle and care, you can count on the Leach Home to offer you the finest retirement experience. The Ellen M. Leach Memorial Home is located in Historic Brewer, Maine. Here you'll find the Leach Home surrounded by nature's beauty while nestled in a grove of stately pines, yet conveniently located within minutes to I-95, Bangor International Airport, Cross Insurance Center, Collins Center for the Arts, Gracie Theater, Penobscot Theater, Bangor City Forest, public libraries, museums, shopping venues, restaurants, medical facilities, golf courses, parks and lakes as well as the extremely popular Waterfront Concert Series and American Folk Festival. We are centrally located with easy access to many of Maine's finest coastal communities, lighthouses and historic sites. 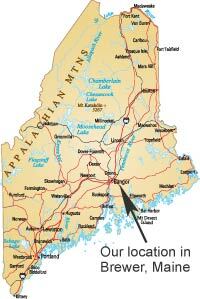 For instance, travel 25 miles to the quaint New England town of Bucksport located at head of Penobscot Bay. Next, cross-over the magnificent and popular Penobscot Narrows Bridge and Observatory to visit America’s First Fort Knox at the Historic Fort Knox State Park. Further down Route 1, visit a working lighthouse at the Fort Point State Park in Stockton Springs. In a different direction, visit one of America's Favorite Top Ten National Parks, the breathtaking Acadia National Park and then stroll through the highly popular seaside town of Bar Harbor, located only 45 miles from the Leach Home. The options are simply endless. Our independent apartment homes offer safety, comfort and convenience to our senior residents. From an upscale dining experience to a variety of activities, the Leach Home offers flexibility to make each experience your own. Contact us for a tour today!